Set oven to broil. Sprinkle both sides of fish with salt and pepper. Brush both sides with half of the butter. Place on rack in broiler pan. Broil with top of fish steak about 4 inches from heat 5 minutes. Brush with butter. Carefully turn fish. (If fish sticks to the rack, loosen gently with a turner or fork.) Brush other side with butter. Broil 4 to 6 minutes longer or until fish flakes easily with fork. 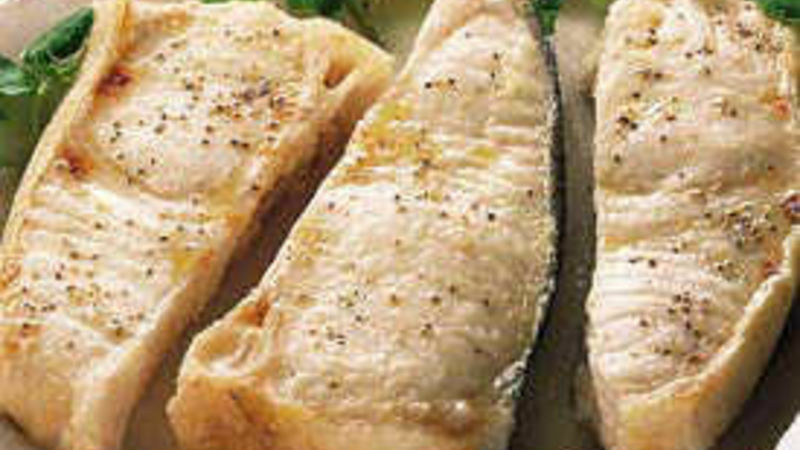 Cut out the fat by spraying fish steaks with butter-flavored cooking spray instead of using melted butter. Using garlic butter or an herb butter gives this simple fish dish fantastic flavor. Refrigerate leftover salmon immediately. Once chilled, it's a tasty addition to tossed green salads.